Were you injured in a car accident while driving somewhere for work? If anyone other than your employer was responsible for the accident, you are entitled to file a third-party injury claim against the negligent party. 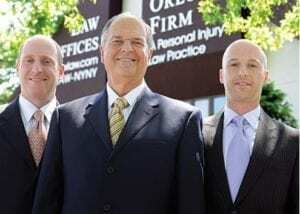 An attorney at The Orlow Firm can help you. As injury attorneys, we have more than 120 years of combined experience and have handled many third-party claims for injured workers throughout New York City. Using our knowledge of the law and extensive trial experience, we will fight for the full compensation you deserve. We believe you should expect the best from any personal injury law firm. When you work with The Orlow Firm, you will speak directly with a partner on your case. If you are a delivery driver and were injured at work, call our Brooklyn personal injury lawyers today at (646) 647-3398 or contact us online. We do not collect attorney fees unless you recover money. A loading dock fails to operate properly. A delivery site has cracked sidewalks, uneven surfaces or other dangers. Safety parts on the delivery truck fail. A workers’ compensation claim can offer some financial relief from missed work and doctor bills, but it will not compensate for all the suffering a work injury causes. Filing a third-party injury claim against a negligent building owner, parts manufacturer or other responsible party can give you the money you need to care for yourself and your family. At The Orlow Firm, we are recognized for our long history of achieving results. Let us fight for your rights and help put you on the path to recovery. If you or a loved one has been injured in a work-related auto accident and you want more information on filing a third-party claim, contact Brooklyn personal injury attorneys of The Orlow Firm. We help protect the rights of ALL New York workers. Call (646) 647-3398 or send us an online message.